Snow most frequently appears white, but deep snow can act as a filter, absorbing more of one color and less of another. Deep snow tends to absorb red light, reflecting the blue tints often seen in snow. Snow is an accumulation of packed ice crystals, and the condition of the snowpack determines a variety of qualities, such as color, temperature, and water equivalent. As weather conditions change, the snowpack can change as well, and this affects the characteristics of the snow. Generally, snow and ice present us with a uniformly white appearance. This is because visible light is white. Most all of the visible light striking the snow or ice surface is reflected back without any particular preference for a single color. Most natural materials absorb some sunlight, which gives them their color. Snow, however, reflects most of the sunlight, creating a white appearance. The watermelon snow at the edge of this glacier in Montana is caused by algae living in the snow. However, snow may also appear blue. As light waves travel into the snow or ice, the ice grains scatter a large amount of light. If light travels over any distance, it must survive many such scattering events. That is, it must keep scattering and not be absorbed. The observer sees the light coming back from the near surface layers after it has been scattered or bounced off other snow grains only a few times and it still appears white. This absorption is preferential: More red light is absorbed than blue. The difference in absorption is small, but is enough that over a considerable distance, say a meter (3.3 feet) or more, photons emerging from the snow layer tend to be made up of more blue light than red light. For instance, if you were to poke a hole in the snow and look down into the hole, you may see a bluish color. In each case, the blue light is the product of a relatively long travel path through the snow or ice. Think of the ice or snow layer as a filter. If it is only a centimeter (0.39 inches) thick, all the light makes it through, but if it is about one meter (3.3 feet) thick, mostly blue light makes it through. Particles or organisms within the snowpack may also affect the color of the snow. 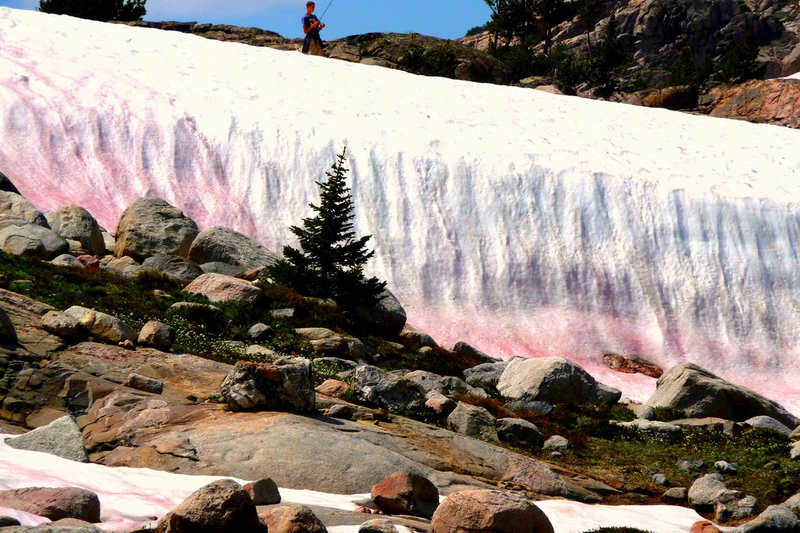 Watermelon snow, for instance, appears red or pink. This coloration is caused by a form of cryophilic, or cold-loving, fresh-water algae that contain a bright red pigment. Watermelon snow is most common during the summertime in high alpine areas as well as along coastal polar regions. Although this snow may look candy-colored, it is not wise to eat it. 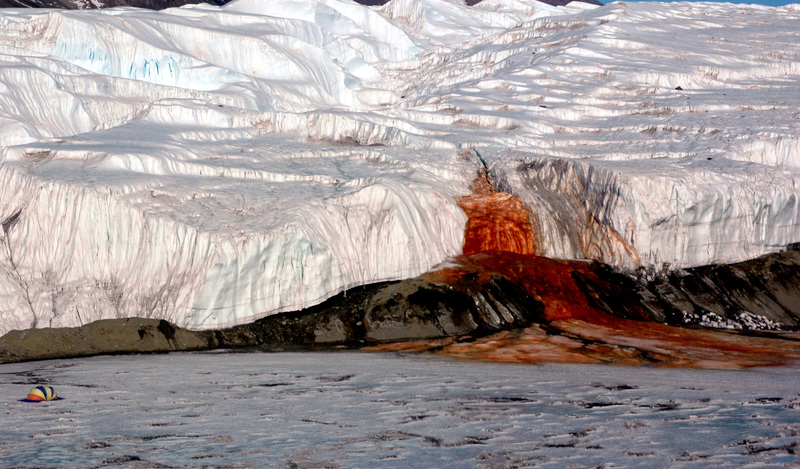 Blood Falls, in Antarctica's Taylor Glacier, also has red snow, but for a different reason. There, the deep red color is caused by saltwater leaking from an ancient reservoir under the glacier. This water is rich in a form of iron that oxidizes when it comes into contact with the atmosphere, producing a bright red waterfall. Iron-rich water leaking from Antarctica's Taylor Glacier produces the deep red color of Blood Falls. The characteristics and age of snow can affect how sound waves travel, dampening them in some cases, or enhancing them in others. For instance, people often notice how sound changes after a fresh snowfall. When the ground has a thick layer of fresh, fluffy snow, sound waves are readily absorbed at the snow surface, dampening sound. However, time and weather conditions may change the snow surface. If the surface melts and refreezes, the snow becomes smooth and hard. Then the surface will help reflect sound waves. Sounds may seem clearer and travel farther under these circumstances. Snow may also crunch and creak. 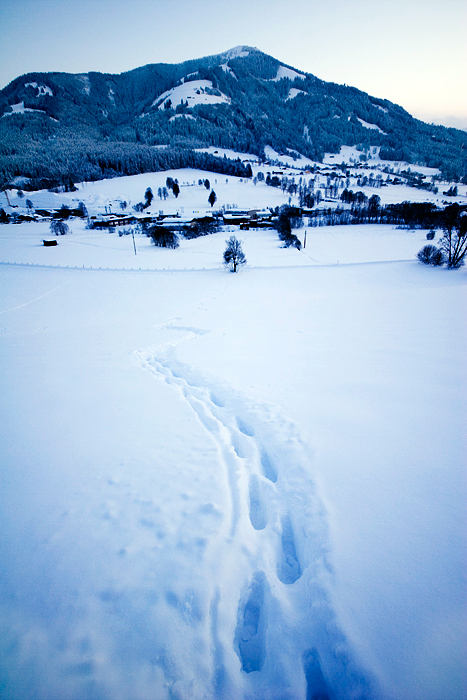 A layer of snow is made up of many tiny ice grains surrounded by air and when you step on it, you compress the grains. As the snow compresses, the ice grains rub against each other. This creates friction or resistance; the lower the temperature, the greater the friction between the grains of ice. The sudden squashing of the snow at lower temperatures produces the familiar creaking or crunching sound. At higher temperatures, closer to melting, this friction is reduced to the point where the sliding of the grains against each other produces little or no noise. It is difficult to say at what temperature the snow starts to crunch, but the colder the snow, the louder the crunch. Snow is such a good insulator that some animals dig snow caves in which to hibernate through the winter. New snow is composed of a high percentage of air trapped among the accumulated snow crystals. Since the air can barely move, heat transfer is greatly reduced. Fresh, uncompacted snow typically is 90 to 95 percent trapped air. Many animals take advantage of snow's insulating qualities, and burrow into the snow to hibernate through the winter. 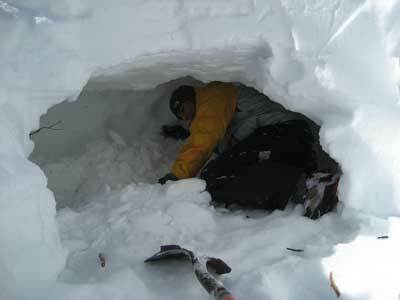 Snow campers sometimes dig snow caves to sleep in, taking advantage of snow's insulating properties. Although snow is cold, the air temperature inside a snow cave will remain higher than the outside air temperature, which can drop significantly at night. The snow surface temperature is controlled by the air temperature above. The colder the air above, the colder the snow layers near the surface will be, especially within the top 30 to 45 centimeters (12 to 18 inches). Snow near the ground in deeper snowpack is warmer because it is close to the warm ground. The ground is relatively warm because the heat stored in the ground over the summer is slow to dissipate. In addition, snow is a good insulator, just like the insulation in the ceiling of a house, and thus slows the flow of heat from the warm ground to the cold air above. Snow is composed of frozen water crystals, but because there is so much air surrounding each of those tiny crystals in the snowpack, most of the total volume of a snow layer is made up of air. We refer to the snow water equivalent of snow as the thickness of water that would result from melting a given layer of snow. An often-repeated assumption claims a ten-to-one ratio of snow to water, but that is not always accurate. The water equivalent of snow is more variable than most people realize. For instance, 25 centimeters (10 inches) of fresh snow can contain as little as 0.25 centimeters (0.10 inches) of water and as much as 10 centimeters (4 inches) of water, depending on crystal structure, wind speed, temperature, and other factors. The majority of new snowfall in the United States contains a water-to-snow ratio of between 0.04 (4 percent) and 0.10 (10 percent), depending on the meteorological conditions associated with the snowfall.